Alongside the regular Jurassic World: Fallen Kingdom toys, Target also has an exclusive Jurassic World Legacy Collection, featuring characters from the original film. 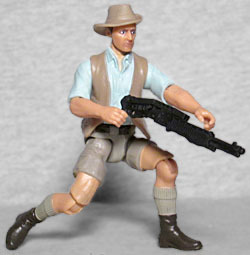 Characters like everybody's favorite man-in-shorts, Robert Muldoon! What kind of danger does Jurassic Park hold? Robert Muldoon, the park's game warden, knows to treat the mysterious creatures with deadly seriousness... or else there'll be deadly consequences to pay! 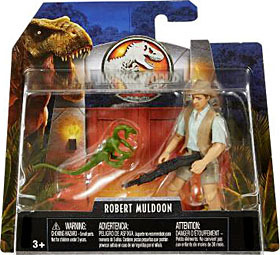 Muldoon was played by Bob Peck, a British actor who was fairly unknown in America before appearing in Jurassic Park. The toy does an okay (but not great) job of reproducing his long, pointed face, though the painting of the eyes will really be what makes or breaks it on any specific individual sample. His slouch hat is permanently glued to his head, not a separate accessory. According to the film, Muldoon had also been game warden at John Hammond's wildlife park in Kenya, meaning that of the two people in the Jurassic Park series who lived in Kenya (the other being Roland Tembo), both of them are white. Sure, that seems likely. Muldoon definitely dresses like someone who's out in the wild, monitoring and managing animals all day: a light, short-sleeved shirt to keep him cool, a vest so he's got pockets, shorts so the animals can be dazzled by his man-legs, thicks boots for protection, and tall socks to keep low-lying branches from scratching him. The sculpt on all this isn't quite up to GI Joe or Star Wars standards, but considering how unimpressive Mattel's previous attempts at 3¾" figures have been, this is a big step up. The articulation is similar: not the best, but better than (Mattel) average. The figure moves at the knees, hips, waist, elbows, shoulders, and head. 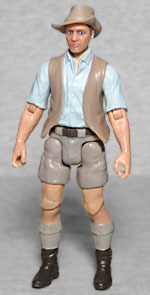 Would we have liked GI Joe-style rocker/hinge ankles? Absolutely we would. Would wrists have made holding his accessory easier? Without question. But are we also glad that we didn't get some 5-POA lump that only has straight peg joints for the hips, shoulders, and neck? You bet we are! Muldoon may not be as flexible as he could be, but there's enough movement there to have a little bit of fun. His accessory is his favorite shotgun, the SPAS-12. It looks too large for a figure of this scale, but what do I know? All my experience with guns comes from GI Joe. 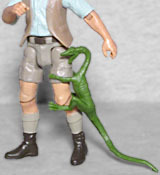 Each of the Legacy Collection figures also comes with a Compy - you know, Compsognathus, the tiny little beagle-sized dinos that totally ate that girl in JP2? Yeah, those. It's molded from green plastic, and can either stand on its own or cling to the figure's body. Cute! The Legacy Collection figures get unique packaging - the standard packaging is silver and orange, while the Legacy packaging adds a dark blue. The backdrop depicts the famous King Kong-inspired gate into Jurassic Park, as seen at night: dark sky, flaming torches, all that. Also, the T. rex is apparently acting as the greeter, because she's standing in front of the gate, seemingly welcoming you. The change between styles is good, because it makes these look like their own things, and if all you want is the old characters, you'll be able to spot them on the shelves easily. 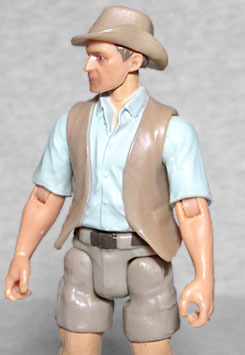 Robert Muldoon isn't exactly a character anyone was clamoring for, but hopefully his inclusion in Series 1 means there will be enough interest left over for a Series 2. And for a character really only known for one line, Mattel sure didn't cut any extra corners on him.